HARBIN, Oct. 21-- A Japanese grenade from the Second World War was found near the China-Russia border, police in Suifenhe city in northeast China's Heilongjiang Province said. A police patrol found the grenade under a pine tree 1.2 kilometers away from the border Tuesday afternoon. 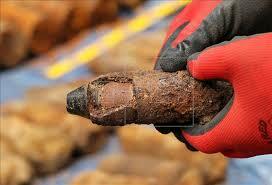 The grenade, with a diameter of 8 centimeters, weighs 2,500 grams and is 30 centimeters long. Local police said although the surface of the grenade is severely rusty, its detonator is largely intact, which means the lethal weapon can still explode 70 years after it was buried under grass. After examining the grenade, experts from the Suifenhe Museum said the grenade belonged to the Japanese troops occupying northeast China. The grenade was believed to be left there during a fight between Japanese and Soviet forces. Japan invaded northeast China in September 1931 and occupied the region until it surrendered in August 1945. The Soviet Red Army attacked the Japanese troops in northeast in 1945 before Japan's surrender. The grenade will remain at the museum for disposal. LONDON, Oct. 21-- Chinese company SinoFortone Group pledged on Wednesday to invest 100 million pounds (156 U.S. dollars) in the London Paramount Entertainment Resort, a new theme park at Kent county. The Paramount resort, including hotels, restaurants and bars as well as themed rides and shows, costs a total of 3.2 billion pounds and is expected to open in 2021. "The resort combines the best of Hollywood through Paramount Pictures, the best of British through the involvement of the BBC and Aardman Animations and now the best of Chinese construction expertise through SinoFortone Group," said Nigel Spray, head of principal investments and advisory at Kleinwort Benson. David Testa, CEO of London Paramount, said that the decision reflected the unique economic and regenerative opportunity provided by the multi-billion pound project. SinoFortone Group is a joint venture between Hong Kong-based Sinolinks Group and Liaoning Fortone Group. BEIJING, Oct. 21-- Beijing will host police chiefs from ASEAN members for an inter-ministerial meeting on law enforcement cooperation from Oct. 23 to 24, the Ministry of Public Security announced Wednesday. The ministry was upbeat that the meeting will result in an improved law enforcement cooperation mechanism between China and ASEAN, according to the ministry. Law enforcement authorities from Australia, Russia, as well as international organizations, such as the Shanghai Cooperation Organization and Interpol, have also confirmed they will attend the meeting, the ministry said. Under the theme "security promotes development," the meeting will focus on regional anti-terrorism, non-traditional safety risks and safety of major facilities, it said. China will also move to discuss security cooperation along the Mekong River separately with nations such as Laos, Myanmar and Thailand. The Mekong region is infamous for narcotics trade and other crimes. WINDHOEK, Oct. 21-- The government of Namibia is negotiating with two Chinese companies on establishing a plant to manufacture foot and mouth disease vaccine. Addressing a press conference in the capital Windhoek Tuesday, agriculture minister John Mutorwa said they have identified the land in the north of the country where the plant will be built. Mutorwa said the foot and mouth disease vaccine plant has been one of the ministry's capital projects but it could not be implemented for lack of technical partners. "It is therefore our great pleasure to now engage the AFECC and Jinyu Group to realize, practically, this important national assignment," Mutorwa said. The two companies are Jinyu Group, which specializes in biopharmaceuticals manufacturing and is involved in research and production of veterinary vaccines, and AFECC, which is a multi-operational business engaged in international project contracting and mineral resources development, among others. Details of the plant, the minister said, will be announced next week. Namibia, which has about two million cattle, is prone to outbreaks of foot and mouth disease with the latest reported in May this year. Although the outbreak was contained, it cost the country 157 million Namibian dollars (about 12 million U.S dollars) and a state of emergency to contain the outbreak.